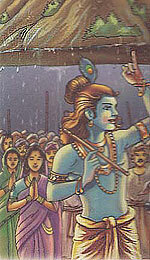 The people of Vrindavan workshipped Indra, the god of rain. Indra was very proud and arrogant and so Krishna decided to teach him a lesson. One day, he told the people that instead of worshipping Indra, They should worship the Govardhan Mountain and its forests on which their livelihood depended. The people of Vrindavan obeyed Krishna and stopped worshipping Indra. Indra became angry and decided to punish them. He called upon the clouds, which were under his control and asked them to rain continuously over Vrindavan. The people were terrified by the heavy rains and thought that the flood would destroy their village and they would all die. Krishna lifted the Goverdhan entire mountain on the little finger of his left hand. He held the mountain like an umbrella for seven days and seven nights over the people of Vrindavan . At last, Indra realised his mistake and was ashamed. He asked the clouds to stop raining and apologised to Krishna.